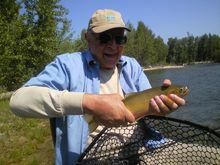 Dr. Bill Soybel, child of the depression, Colonel in the Army, Commander in the Navy, internist, lecturer in medicine, angler, sly teller of profoundly funny stories, and forever beloved of his wife, six children, 12 grandchildren, and 7 great-grandchildren, died on a cold and sunny Armistice Day, 2018. He was 86. Born in 1932, Bill was the younger of two sons of Abraham and Frieda Soybel of Hamden, CT. At four years old, he knew he wanted to be a doctor. At 16, Bill left Hamden High School and his job as a soda jerk at the family pharmacy to attend the University of Chicago. While studying literature and the atom, he met the love of his life, Ruth Eisenstein. They were married for 65 years and raised six children: Debra, David, Amanda, Halle, Jeremy and Phyllis. They lived in Lexington and Bill practiced in Waltham, where at first he drove a baby blue Jeep. Before the electronic medical record and HIPAA, his "filing system" was the back seat. He completed 25 years of active service and reserve duty in the medical corps of the Navy and the Army, eventually assuming command of the 309th Reserve Field Hospital at Hanscom Field and at Fort Devens. His children's friends from Lexington High School may recall that he and Ruth allowed them to use the "ancestral" split-level home on Winchester Drive for holiday caroling and musical cast parties. His influence with authorities as local medical examiner probably saved some classmates (not naming names) from later having to request that certain records be sealed. He traveled to China and Morocco and any ski slope within reason. He earned his pilot's license and lived his fantasy of flying a World War I biplane with a white scarf draped just so. In retirement, he lectured at Boston University's School of Medicine, waded into Massachusetts' rivers with fish lures he'd tied himself, and visited his impressionist friends at the Museum of Fine Arts. He and Ruth crisscrossed the United States to see their children, grandchildren, and great-grandchildren, watching over family gatherings with a smile and his signature roll of the eye. He would sit quietly, listen, and then gently say something to settle a question you then realized was the only one that mattered. He loved reading Henry James and philosophy. He could get very annoyed if he learned he had not gotten the best deal on a fishing rod. If he or Ruth started to recite a poem, the other would finish it. He never turned down a good corned beef sandwich. He gave excellent advice when asked. He never lost his sense of the absurd. He never lost sight of what was important. We will miss him every day. Services will be held on Wednesday, November 14, at 11:30 a.m. at Concord Funeral Home at 74 Belknap Street, Concord. Dr. Soybel will then be interred at Westview Cemetery at 520 Bedford Street, Lexington. The family will have visiting hours at their home at 8 Deer Grass Lane, Acton, from 3-6 p.m. on Wednesday, as well as 4-7 p.m. on Thursday and Friday. In lieu of flowers, please send donations to Emerson Hospital in honor of those working in the Transitional Care Unit.